This outfit reminded me of a gangster from the 1920's/30's? You know the kind with pinstripes and a trilby?! Something out of Bugsy Malone! I thought I'd whip my black cowboy hat out again seeing as we're having rather beautiful weather in England at the moment. Maybe Spring has arrived after all?! 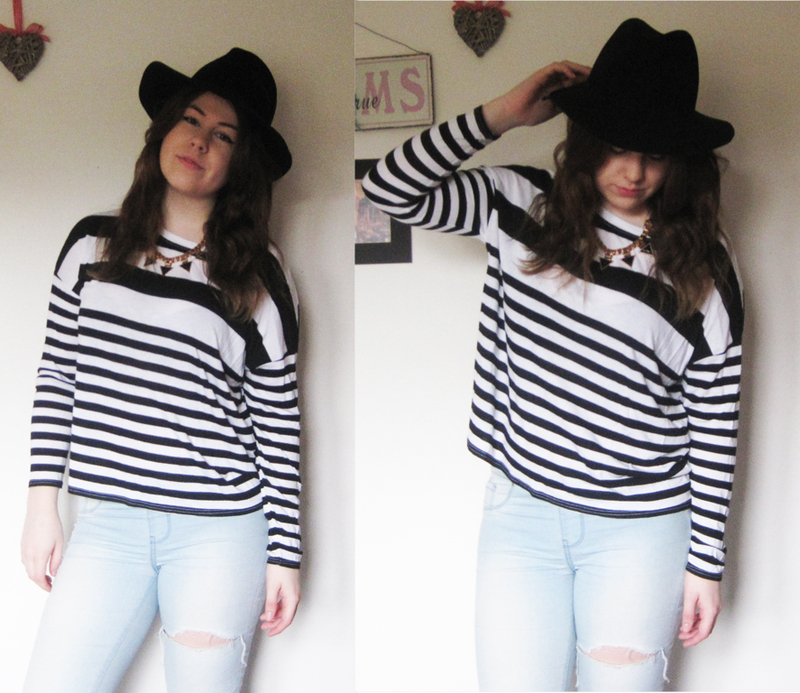 I wore my black and white striped Jersey top from Topshop just to add a monochrome theme that would work well with my main accessory being the hat. I then wore light blue ripped jeggings, which are too convincing for jeans! I bought these from NewLook forever ago but after falling over and tearing the knee's I did a little DIY and transformed them into what you see today. This just toned down the more formal look that was starting to peep through. I always feel a little over the top with my black hat, which is why I tend to add something over casual to bring it back down to my comfort zone. Finally I added a gold and black necklace for final touches!